Moving testimonies Daniel Zaccaro, a 25 year old Italian from a poor, crime-ridden neighbourhood of Milan narrated how he sank into crime, landing in prison at the age of 18. But good souls helped him come out of the dark tunnel and today he is in university. Another young man from Iraq, Aziz Sadeq, narrated how in just one day, without warning, he lost his home, friends, family and dreams when terrorists invaded his village. He was 18. After two months of despair in exile, France welcomed his parents, where Sadeq has managed to rebuilt his life. He has graduated from high school and is in the university today. "WE FOR Unique, creative supporters "
Here are the written questions ... The Synod Fathers will give you the answer. Because if I gave the answers here, I would cancel the Synod! The answers must come from everyone, from our reflection, from our discussion and, above all, must be answers made without fear. I will limit myself only - with respect to all these questions - to say something that can serve, some principle. To you, young people, who have spoken, who have given your testimony, who have come a way, I say: this is the first answer. Make your way. Be young on the move, looking at the horizons, not the mirror. Always looking forward, on the way, and not sitting on the couch. So many times I have to say this: a young man, a boy, a girl, who is on the couch, ends up at the age of 24: it's ugly, this! And then, you said it well: that makes me find myself is not the mirror, the look as I am. Finding myself is in doing, in going in search of the good, the truth, the beauty. There I will find myself. Then, in this way, another word that struck me is the last one. The last one was strong, but it's true ... Who did it? ... You. It was strong: consistency. Consistency of life. I make a journey, but with coherence of life. And when you see an incoherent Church, a Church that reads you the Beatitudes and then falls into the most princely and scandalous clericalism, I understand, I understand ... If you are a Christian, take the Beatitudes and put them into practice. 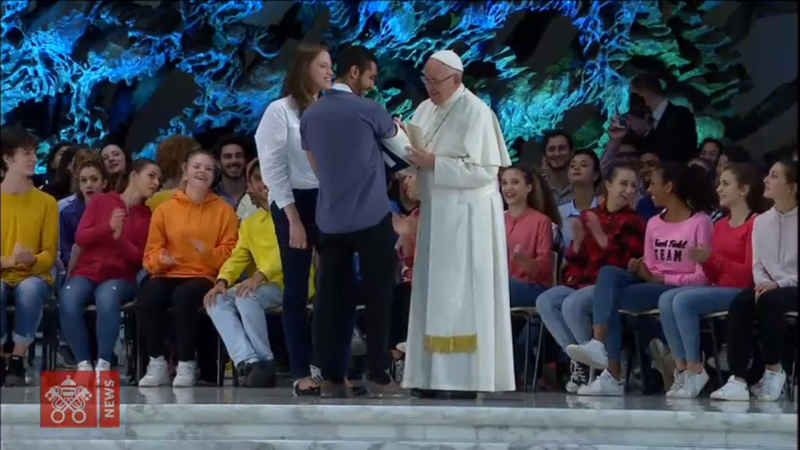 And if you are a man or a woman who gave your life, you consecrated her; if you are a priest - even a priest dancing [refers to a testimony] - if you are a priest and you want to live as a Christian, follow the path of the Beatitudes. Not the path of worldliness, the path of clericalism, which is one of the ugliest perversions of the Church. Consistency of life. But you too [turn to the young], you must be consistent in your way and ask yourself: "Am I consistent in my life?". This is a second principle. Then there is the problem of inequalities. We lose the true sense of power - this applies to the question of politics - we lose what Jesus told us, that power is service: the real power is to serve. Otherwise it is selfishness, it is lowering the other, not letting it grow, it is dominating, making slaves, not mature people. The power is to make people grow, to become servants of the people. This is the principle: both for politics and for the consistency of your questions. Then, more questions ... I'll tell you something. Please you, young people, boys and girls, you have no price! You are not auctioned! Please do not let yourself be bought, do not let yourself be seduced, do not let yourself be enslaved by ideological colonizations that put ideas into our heads and eventually become slaves, dependent, failed in life. You have no price: you must always repeat this: I am not at auction, I have no price. I am free, I am free! Fall in love with this freedom, which is what Jesus offers. Then there are two things - and I would like to end with this - among the ideas you have said and to which the Synodal Fathers will respond by dialoguing with your questions. The first is on the use of the web. It's true: the interconnection with digital is immediate, it's effective, it's fast. But if you get used to this, you will end - and this I will say is real - you will end up like a family where, at the table, at lunch or dinner, everyone stays with the phone and talks to other people, or they communicate with the phone, without a concrete, real relationship, without concreteness. Every road you make, to be reliable, must be concrete, like experiences, many experiences that you have said here. None of the testimonies you gave today were "liquid": they were all concrete. The concreteness. The concreteness is the guarantee to move forward. If the media, if the use of the web takes you out of concreteness, makes you "liquid", cut it off. Cut it. Because if there is no concreteness there will be no future for you. This is sure, it is a rule of the road and of the journey. And then, this concreteness also in the reception. Many of your examples, which you have done today, are on the reception. Michel asked this question: "How to overcome the increasingly widespread mentality that sees in the stranger, in the different, in the migrant, a danger, the evil, the enemy to be hunted?". This is the mentality of the exploitation of the people, of making the weakest slaves. You close not only the doors, you close your hands. And today populisms, which have nothing to do with what is popular, are a little fashionable. Popular is the culture of the people, the culture of each of your peoples that expresses itself in art, is expressed in culture, is expressed in the science of the people, is expressed in the party! Every people makes a party in its own way. This is popular. But populism is the opposite: it is the closure of this on a model. We are closed, we are alone. And when we are closed, we can not go on. Be careful. It is the mentality that Michel has said: "How to overcome the increasingly widespread mentality that sees in the stranger, in the different, in the migrant a danger, the evil, the danger to be hunted?". We win with the embrace, with the welcome, with dialogue, with love, which is the word that opens all doors. And at the end - I spoke of concreteness - each of you wants to make the road in life, concrete, a road that bears fruit. Thanks to you [Giovanni Caccamo] for the photo with your grandfather: it was perhaps that photograph, the best message of this evening. Talk to old people, talk to grandparents: they are the roots, the roots of your concreteness, the roots of your growth, flourish and bear fruit. Remember: if the tree is alone, it will not bear fruit. All that the tree has of flower, comes from what is buried. This expression is from a poet, it is not mine. But that's the truth. Stick to the roots, but do not stay there. Take the roots and bring them forward to bear fruit, and you too will become roots for others. Do not forget photography, the one with the grandfather. Talk to your grandparents, talk to old people and this will make you happy. Thank you very much! These are guidelines. The answers, to them! [points to the Synod Fathers] Thank you, thank you!